The Sikh community rallied to offer shelter and food in gurudwaras after a van rammed into a crowd of pedestrians at Barcelona’s iconic Las Ramblas killing several and injuring more than 50 people. Harjinder S Kukreja from Punjab tweeted the details of the gurudwaras that can offer shelter and food to those in need. 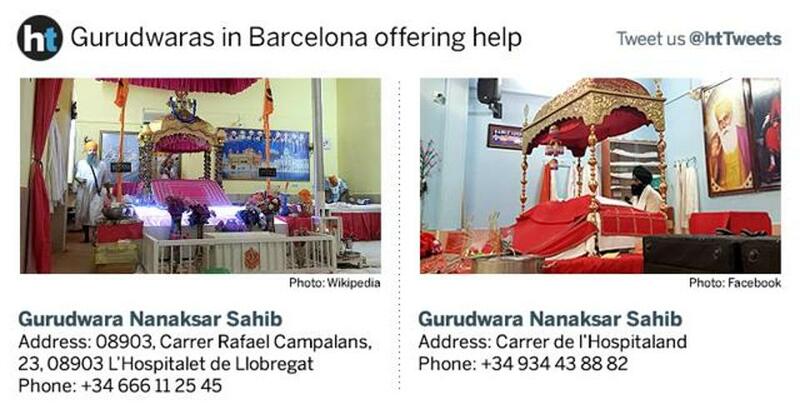 “If anyone needs shelter, food, Sikh houses of worship in the Spanish city are open for all,” Kukreja tweeted. His post was retweeted 4,500 times and more than 200 people commented on it. Twitter users appreciated the “beautiful gesture” by the community to open their places of worship during emergencies. “As ever the #Sikh community is a credit to humanity at a time of unspeakable cruelty & tragedy (sic),” tweeted Chas Peeps. External affairs minister Sushma Swaraj confirmed there is no report of any Indian casualty in the attack. In case of emergency, Indians can contact the Indian embassy in Spain at +34-608769335. “I am in constant touch with Indian Embassy in Spain. As of now, there is no report of an Indian casualty,” Swaraj tweeted. Facebook has also activated its safety check mechanism, allowing users near #Barcelona attack to mark themselves as safe. Police in Barcelona have asked people around that region to stay indoors. They have urged those concerned about friends and family to use social media, rather than cellphone calls to avoid overloading phone networks. Spanish police killed five “terrorists” in the town of Cambrils to stop another vehicle attack. The shootings in Cambrils came after a van ploughed through crowds in the centre of Barcelona, killing 13 people and injuring dozens more. Police say the men in Cambrils are linked to the first attack that ISIL claimed responsibility for. Al Jazeera’s Sonya Gallego reports from Barcelona. The Islamic State of Iraq and the Levant (ISIL, also known as ISIS) has claimed responsibility for a deadly van-ramming attack in one of Barcelona’s busiest tourist areas. “The executors of the Barcelona attack were soldiers of the Islamic State,” ISIL’s Amaq outlet said on its Telegram messenger account, without naming those it claimed were behind the attack. Police described Thursday’s violence as a “terrorist attack”. Catalan police said on Friday they had killed the perpetrators of a “terrorist attack” in the town of Cambrils, south of Barcelona, following a police operation. Spain’s public broadcaster, RTVE, reported that regional police troopers killed four people and injured another. It was not clear if the operation was connected to Thursday’s van attack. Catalan emergency services said on Twitter that people in Cambrils should “stay home, stay safe”. The Thursday van attack in the northeastern Catalan city was the country’s deadliest since 2004 when al-Qaeda-inspired bombers killed 192 people in coordinated attacks on Madrid’s commuter trains. Joaquim Forn, Catalonia’s interior minister, confirmed the death toll on Twitter. At least one Belgian national – a woman – was among those killed, the country’s Foreign Minister Didier Reynders said on Twitter. Catalan police chief Josep Luis Trapero said that an explosion which killed one person and destroyed a house in the town of Alcanar, 200km south of Barcelona, on Wednesday night, was “clearly” linked to the attack.